Crew members are preparing for the Def Leppard and KISS Summer Tour 2014 with photos posted online. 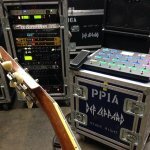 Rosh Roslin has announced via Twitter/Instagram that he is working for Vivian Campbell on the tour programming his guitar rig. Rosh started work on 8th May and has so far posted two photos of Vivian's guitar rig which can be seen below. The band (minus Vivian) are due to get together again in Dublin at Joe's house very soon to write/record and rehearse for the tour. The Summer Tour 2014 kicks off on 23rd June in West Valley City/Salt Lake City, UT. Further rehearsals with the full band will take place (as is normal) in the US before the tour starts. In 2012 when the tour kicked off in the same city the band did production rehearsals at the EnergySolutions Arena.